First published in The Tablet in January, 2006; we ran it here in 2015. Thirty [now more than 40!] years ago, when I was a doctoral student at the University of Arizona, our campus in Tucson lay beneath the landing path of the Davis-Monthan Air Force Base and every few minutes our planetary science classes would be interrupted by the roar of a jet fighter. But an occasional plane would cross overhead with a different sound... an odd, almost quiet whine. Looking up you’d see the large black cruciform, long straight wings and a thin fuselage, of a U-2 spy plane. For twenty years they’d flown photography missions over Soviet Russia and other cold war hotspots. But one U-2 was different. Rather than spooky black, it was painted pure white. And instead of air force emblems, it flew NASA insignia. A visitor to our Lunar and Planetary Laboratory, Don Brownlee from the University of Washington, explained those flights to us. 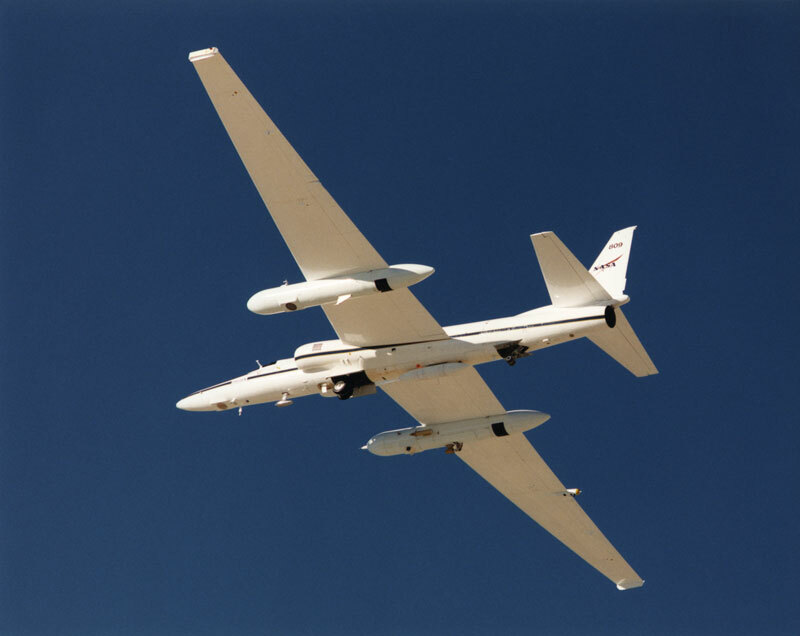 With boyish enthusiasm – he looked like a teenager, though in fact he was ten years older than me and already an established scientist – he described how the U-2 carried thin metal plates covered in oil, designed to collect dust from the upper stratosphere. Much of that dust was terrestrial pollution. But with careful discernment, you could pick out bits of meteoritic iron, or small rock grains rich in carbon, water, and nitrogen: dust from comets and asteroids. The stuff of shooting stars. Dust astronomy got its real start in the 1970s. Before then, people had worked out how dust in space could affect the light gathered by our telescopes, and on very dark nights you could observe faint glows – the “zodiacal light” and the “gegenschein” – reflected off the dust in the plane of the planets. But along with observing light as it passed by the dust, why not learn things from the dust itself? Unlike photons of light, you can take bits of dust into the lab, measure their chemical composition, count the very isotopes made in stars and supernovae. Eberhard Grün, in Germany, proposed what he called “dust telescopes”: devices in space that would gather and analyze the dust passing through the solar system. And Don Brownlee worked out how to collect the dust hitting Earth itself. The only trouble is that, unlike light, you can’t tell where the dust actually comes from. As I showed in my doctoral thesis at Arizona, any number of forces from solar magnetic fields to the pressure of sunlight itself is enough to scramble the directions that the dust travels. A long-standing argument has raged over Brownlee’s dust: does it come from comets, or asteroids? The only way to settle it, is to go to the source itself. Last fall, the Japanese Hayabusa spacecraft (described in my October 2004 column) grabbed dust from the surface of an asteroid; if all goes well, it might get its sample back to Earth in a year. And [in 2005], a sampler of dust from a comet returned safely to the Utah desert. On the BBC I watched a still boyish-looking Don Brownlee, now in his 60s, describe with joy the culmination of his seven year spacecraft mission and his forty year research career. To read those messages will take years of further work, of delicate analyses in laboratories around the world. But like those other whispers from heaven, the urges and inspirations and temptations that flash across our consciousness like shooting stars, their true meaning and significance only becomes clear when you know for sure where they come from. Added in 2015: The results of the Stardust mission have been quite impressive… and years later we're still recovering new bits and learning new things. Perhaps it's time to update this column? Were you to update the column to discuss Stardust results, you could also include the minuscule specks that Hayabusa brought back in 2010 from its target, asteroid Itokawa.